Hong Kong's greatest secret revealed through the lenses of National Geographic photographers. This innovative partnership celebrates one of Hong Kong's greatest secrets: its stunning natural beauty. 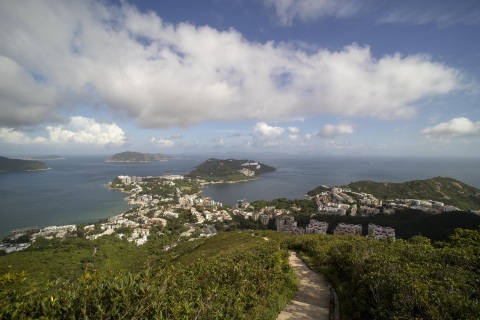 Three-quarters of Hong Kong’s landmass is actually countryside, and the vast network of hiking trails is easily accessible from any corner of the city. The Great Outdoors campaign showcases imagery of city views with verdant mountains; traditional villages with natural flora and fauna, and beautiful landscapes with stunning seascapes presenting Hong Kong as a jaw-dropping, breathtaking visual dichotomy. Trail runner Wyan Chow Pui-yan, who was the first local female to win the Vibram Hong Kong 100 and who placed 17th in the Ultra Trail World Tour, leads the Nat Geo team into Tai Mo Shan Country Park — and the city’s tallest mountain at more than 2,000 feet (900 meters) above sea level. Chow and her godmother, who runs a popular kiosk in the park, share their insights on hiking and trail-running along Tai Mo Shan, as well as their love for the magnificent sunset views of the highest peak in Hong Kong. About Hong Kong: Hong Kong's storied history, award-winning food and libations, vibrant arts and culture scene, and stunning great outdoors has made it widely-known as one of the most exhilarating destinations in the world. Its mesmerizing contrasts of east and west, modern and ancient, and urban and natural leaves its visitor's endless choices when planning a trip to Asia's World City. Visit www.discoverhongkong.com for more information; follow Hong Kong Tourism Board on Twitter at @HongKongTourism for the latest Hong Kong news.